← Finally! A Tutorial for Book Busters and Writer Biters! Though I still have my hair and teeth, I can attest to the truth of O’Connor’s ballsy statement. I would add that The Plunge into Reality is also often highly disruptive, can make a mess of the rest of one’s life, its daily responsibilities and routines, and can result in significant in collateral damage and civilian casualties (miffed family, friends, missed appointments, forgotten promises, commitments). Just try to act normal. If someone asks, “So how’s the novel going?” For Godsake, just say “Fine!” and leave it at that. 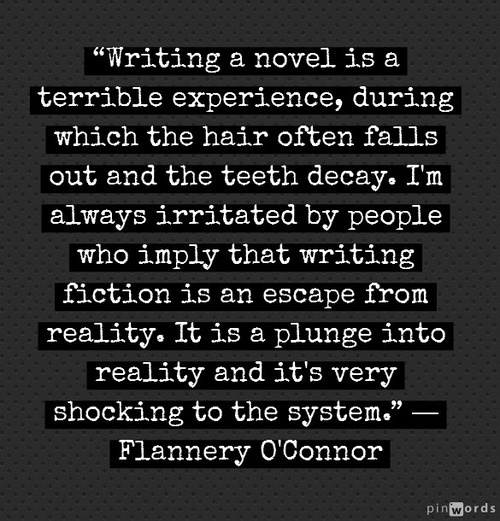 This entry was posted in Humor, Literature, writing and tagged creative personality, creative process, fiction, Flannery O'Connor, Literature, novel, writing. Bookmark the permalink.